Well, not quite free! The 5% Federal and 7% Provincial Sales Taxes are paid, insurance is paid, registration is complete and the temporary Texas Plates are off! I added a Daylight Running switch to the headlights to conform to Canadian Law and the Tioga is now legal! Now I start the little jobs that have to be done to make it comfortable like adding a solar panel and controller, wiring a cable to bring the Satellite signal in and replacing a troublesome lock on a small outside door. I will be adding to this list as I go. I also have to take out a lot of the "stuff" that accumulated in the old rig over the years that never gets used but adds a lot of weight and takes up space. Then I have to get it down to the body shop to repair a pushed in aluminum door on one of the basement compartments where a neighbour greeted us home by backing her car into the motorhome! She evidently had been using our driveway as a turn around spot while we were gone and didn't notice the motorhome parked there! There is not much damage but it is the first blemish on the rig so I want it fixed. Paint matching will be the problem, I am sure. Well, that was a piece of cake! We showed up at the USA Customs a couple of hours before the ferry sailed. All they wanted to see was Proof of Purchase and the Titles to the motorhome and Dolly. They stamped both Titles as being exported and we were on our way. No muss, no fuss and no fees! We are in an RV Park near the Port Angeles Ferry. We are making sure we have all the required documentation ready for when we board the 2:00 PM Ferry to Victoria tomorrow. 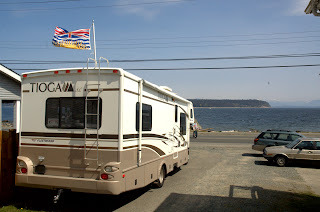 We have to export the motorhome and dolly from the USA and import them into Canada. We then have a limited amount of time to have the propane re-certified and the headlights modified to Canadian Standards. In Canada headlights must come on automatically when the vehicle is started. I am sure everything will go smoothly but I feel like I am back in High School getting ready to give a report. We topped off the gas and propane tanks with cheap (cheaper than Canada anyway) USA products, listed all our purchases and arranged the cupboards in case Customs wants to have a look. I hope I remembered everything as we have been away since November 1, 2007! We have been "boondocking" the past few nights on our way home so have been out of touch. Tonight we are in La Grande, Oregon in a Wal Mart parking lot and I HAVE WIFI!!! It might be coming from a Radio Shack about 100 feet away. No way to tell! It is very cold here and we ran into a little falling snow a few miles back. The furnace will get tested tonight! The cheque from the Insurance company arrived at the repair shop the same day we went to pick up the motorhome. Now that is good service! I put the repairs on my credit card and will pay them off with the insurance cheque when we get home. 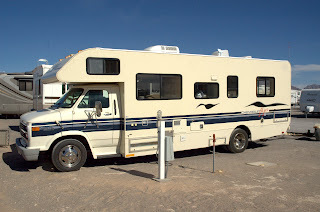 We finally got everything transfered over to the new motorhome and left El Paso, picking up the new dolly in Las Cruces, NM. I have never had electric brakes before and have been having a hard time setting things up. Every once in a while the dolly brakes lock up, causing my heart to beat rapidly and leaving a nice smoke trail behind. My first thoughts on the new motorhome are that it is much more comfortable to live in than the old one, thanks to the slide and extra two foot length. The handling, however, is another story. It really sways in high winds and when being passed by semi's. The Cruise Control is a lot different that the Chevy. It wants to gear down way more often, both going up and downhill. It will not let you gain speed downhill to make the next uphill easier. Instead, it does everything it can to maintain speed uphill, sometimes going down to second gear and revving up to 5000 RPM at about 45 MPH! Now that gets your attention. My son thinks the swaying can be improved with the addition of an additional leaf to the rear springs. I guess I was spoiled by the extra heavy duty frame and larger tires under the old rig. The Ford V-10's gas consumption seems a lot worse than the Chevy 454. This is probably contributed to by the Cruise Control problem. I am told I can replace the electronic "Chip". I will investigate this when I get home. It may help the Cruise Control problem. I just did my mileage calculations. The three tankfulls I have put in it so far have yielded 5.1, 7 and 7.5 MPG. The difference is explained by the mountainous terrain and perhaps that for the last tank I took it off Cruise Control whenever I saw a hill coming up. The repairs on the old motorhome are finally completed. We drove over to inspect the roof and it passed the "hose for ten minutes" test. We intended to move the old rig over to the Camping World free overnight area where the new rig is parked to start the process of moving everything over prior to putting the old one in storage for our son to pick up in May. The repair shop then told us that it would not release the old motorhome until they were paid. The letter we got from the Insurance Company clearly stated that we pay the repair shop only the $500 deductible and the insurance Company will mail them the balance. Well, they were having nothing to do with that. They wanted the money or they were keeping the motorhome and the cheque could take a month to get to them. So... Out came the Visa Card again and the $4500 roof repair went on it. They solemnly promised to endorse the cheque when it comes in and to mail it to us in Canada. They better! The new motorhome is bigger and has tons of basement storage which the old one did not have but we can't get everything to fit! 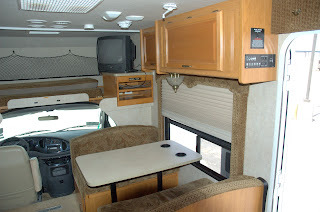 We threw out a bunch of stuff and will send more home in the old motorhome. It probably did not help that Norma bought a new barbecue. It will take the place of the tables that used to ride in the back seat of the car that now have their own storage bin. The StarChoice dish will still have to ride in the passenger seat of the Honda. Tonight we start moving clothing out of the old rig and into the new bedroom. That should be fun!! Today we spent emptying the old motorhome and putting everything into a storage area the RV Park owners kindly provided. There was more "stuff" in it than there has been in some of the small apartments we have rented in our youth! We will have to do something to reduce the load as we would never get past a weigh scale! 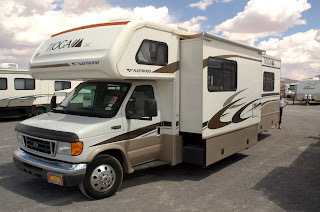 We do not take possession of the new motorhome until Tuesday or Wednesday but because the old motorhome goes into the shop Monday morning for a week, Camping World Sales is letting us move into the new unit Monday. 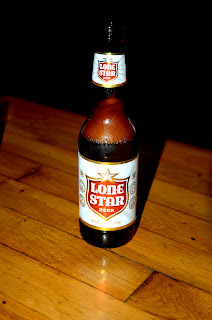 We will boondock in their parking lot until the wired cash reaches Texas (how long can that take?) and the title can be signed over. This was very kind of Camping World as it will save us a couple of nights in a hotel. 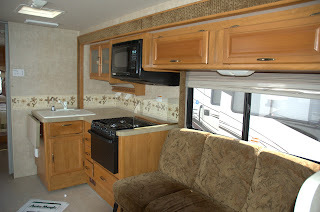 We finally replaced the old motorhome! 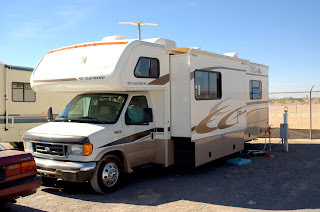 We bought a 2005 Tioga Class C, 31 foot, Model 31K, on a V-10 Ford E450 Chassis in "as new" condition here in El Paso, Texas. It is exceptionally clean, and has only 4,400 miles on the odometer! Norma says the kitchen appliances look unused. 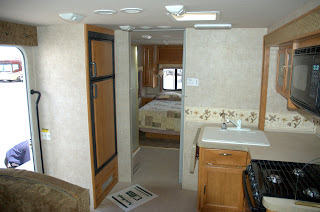 The kitchen / living room slide will give us almost double the usable space of the old unit and it is still small enough to handle Mexican roads and campgrounds with ease. We got a call from J.P. at Camping World Sales, the same place we looked at the Monaco, telling us that a unit had just come in that we should see. It had not even been washed yet but we were the first ones to look at it and we liked it right away. It drives much like the old one so I was very comfortable with it and the big V-10 will pull the car with no problem. Unlike the Monaco, we do not have to stretch our budget to handle this one. They are checking everything out and getting it ready for us today and they will store the old motorhome until our son (the new owner) can fly down to pick it up. Once again, it was a pleasure to deal with J.P. and the Sales staff at El Paso's Camping World. Unlike Canadian RV salesmen, they are not high pressure down here. We go back this morning to pay for it. 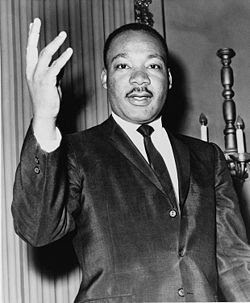 On April 4, 1968, forty years ago today, Dr. Martin Luther King was assassinated. The Dreamer was dead. Something died in all of us that day. I was 22, living in Vancouver, BC and just beginning to form some of the activist ideals that would stay with me to this day. 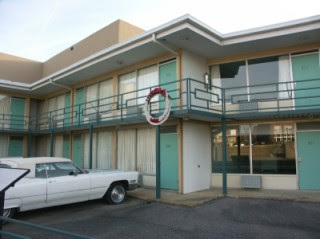 I had watched the Civil Rights struggle from so many miles and so many worlds away. I was the colour of the oppressor but identified with the oppressed. I was ashamed of my colour and ashamed of myself for sitting back and doing nothing to correct so obvious a wrong. 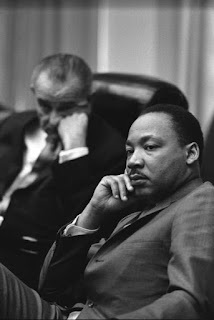 The assassinations of John, Martin and Bobby in such a short period of time changed everything forever. Simple idealism was no longer enough. Dedication to a cause suddenly became much more of a commitment than before and the “Right Wing Conspiracy” was no longer just a theory. The Dreamer is dead but the Dream is alive. We see it every day lately in people like Obama and others. 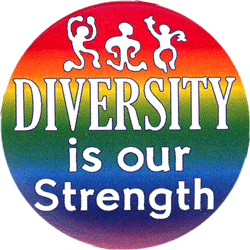 The first tentative steps have been taken but there is so far yet to go….. When our friend Les caught up with us here in El Paso, he arrived with a GPS and glowing recommendations about how well it worked for him. The three of us went out for dinner and tested the GPS's ability to find our way home after dinner. A female voice warned me of every turn along the way and got us home. I decided I need one of these toys so I started researching on the Internet and decided on a Garmin 260. It is the lowest of the Garmin line that comes with full North American maps included. It does not include Mexico maps but they may be purchased separately. The price of these units here in El Paso varies all over the map. Fry's is the lowest at $220 but has no local store and their mail order is a nightmare. Circuit City is the highest at $389 (don't they ever do comparative shopping?). Wal Mart has them in the store for $279 and online for $233. I tried to order one from Walmart.com but found they will not sell to anyone without a USA bank issued credit card and a USA address! I got around this by going to the store, buying a Gift Card for myself and using the Gift Card to order online. I don't know why they do not like to sell to Canadians but my sneaky method worked and it will be delivered to the local store for me to pick up in a week or so. I will never be lost again! Our insurance claim for the "tunnel" damage to the motorhome roof was approved! We have moved to a small RV Park attached to the repair facility here in El Paso, the roof has been measured and parts ordered. We will be getting a complete new rubber roof! It will take three days to get the parts and five days to make repairs. I will keep you informed.